As part of New York Real Estate Tech Week 2018, we organized a side event with the Consulate General of Finland and Business Finland. We got an opportunity to meet 6 Property Technology companies from the Nordics. There was a good variety of companies providing products and services from e.g. IoT to indoor air solutions and VR technologies. Showcases began with Rakli’s presentation of the current situation of PropTech in the Nordics. For example, we learned that there are more than 320 PropTech companies in the Nordics of which 87 come from Finland. From the companies, Disruptive Technologies was the first one to present. With their wireless mini sensors it is possible to create smarter Real Estate solutions! Next up was Rockwool, which is one of the most successful construction companies from the Nordics. They use the advantages of stone in creating Fire and Soundproof Insulation. Wirepas is also creating Smart Buildings! With their product, Wirepas Mesh, it is possible to connect things with unprecedented scale, density, flexibility and reliability. Moving to Sales and Marketing of Real Estate: Unrealer offers a digital platform, which connects large Real Estate Corporations and Artists. By fulfilling the gap between those players, it is possible to manage 3D visualizations, AR, VR, MR, animation videos etc. technologies, and thus, to create better marketing. 720 Degrees is a company enhancing the quality of indoor air. 720 analytics monitor the indoor environment and automates all necessary compliance and reporting which enables detecting problems immediately when they occur. The last company of the day was also dedicated to improving indoor air. 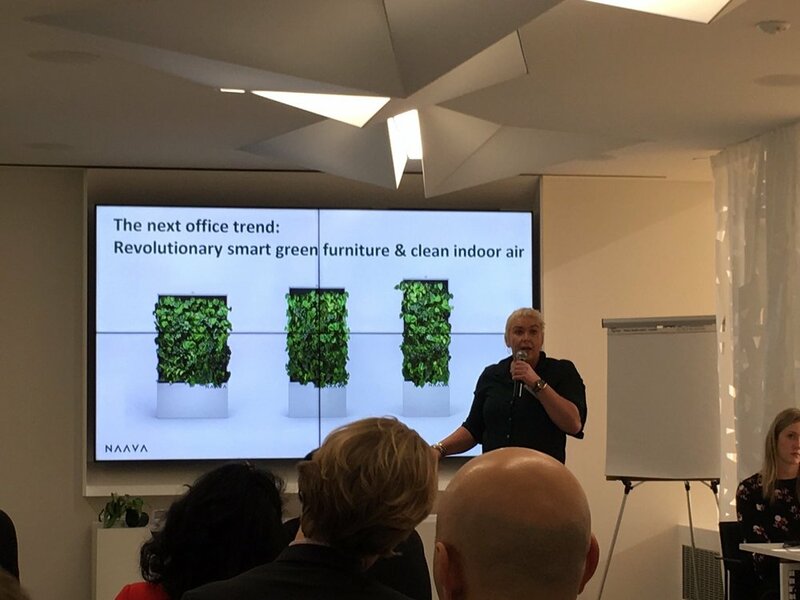 Naava fights again indoor pollution with their green walls! The green walls contain biofilters that purify the air. Besides the health effect of the walls, they look beautiful and make a good decorating element. Thanks for all the companies and guests! It is always amazing to see great innovations coming from the Nordics!